Over the years, a basically passive-reactive approach to governing – a model of sorts – has been passed down and has predominated – and probably still predominates – in both the for-profit and public/nonprofit sectors. This approach – or model – sees the governing board as basically a responsive body, rather than as a generator or initiator of actions or products. You can picture the passive-reactive board sitting at the pinnacle of the organization, waiting for staff-initiated things – policy recommendations, documents such as plans and budgets that call for adoption, briefings that require no action, etc. – to arrive, usually in writing but sometimes orally presented. These things that are read or heard may or may not require formal review and action. If they do, the board is expected to respond; if not, it can just become better informed. It is important to keep in mind that some of the best briefed, most fully informed boards I have witnessed over the years have been the least effective in governing. Knowledge alone is not power in the governing business. In keeping with the highly popular passive-reactive model, the board is essentially a more or less insightful and critical audience for staff work. Indeed, one of the hallowed principles of the model is that staff should always “care enough to send the very best” to their boards, making sure that the documents – whether a plan, budget, or something else – are well thought out, meticulously crafted – in short, finished. Even if, following the passive-reactive model, a board is supplied with options to choose from, they should be well defined, and the board is not expected to help fashion them in the first place. 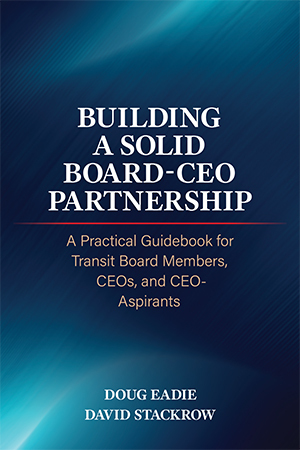 The most that dedicated, hard working boards can hope to achieve under this model is to ask critical questions and raise issues that might not have been addressed. However, since the products have been carefully produced and basically finished, asking too many tough questions can wreak havoc at the tail-end of a planning cycle. A board’s employing the passive-reactive approach in governing is like the Cleveland Orchestra’s playing only elevator music, or Picasso’s confining himself to illustrating advertisements; none of the three have a chance of realizing their tremendous potential in practice. Leadership limited to reaction cannot begin to capitalize on the experience, expertise, talent, knowledge, and connections that board members bring to the table. The losers are the public/nonprofit organizations governed by these boards and, ultimately, their clients and customers. In the constantly changing, always challenging, and frequently threatening environment in which public/nonprofit organizations function these days, board members can be a precious resource in setting directions and fashioning strategies, rather than merely reviewing and reacting to them. Reacting rather than playing a meaningful role in shaping and producing will impede development of ownership among board members, which is an essential ingredient in building and sustaining commitment. This absence of ownership and, hence, lessened commitment has serious implications for CEOs who are depending on strong board support in following through on decisions, especially when they involve substantial risk or arouse significant controversy. Who of you has not witnessed at least one CEO leading a charge, only to look back and see the board in rapid retreat from a strategy it had never really owned, despite having formally reviewed and adopted it sometime in the past. And because passive-reactive boards are underemployed, board members inevitably move along one of two paths: boredom, somnolence, and waning commitment; or dissatisfaction, frustration, irritation, and often anger. The latter path is probably more common since the high-achieving types that populate boards have become accustomed to exercising serious influence and to producing significant impact in their lives off the board. Therefore, they feel keenly the absence of like influence and impact in their work on the board. “Is this all there is to life on the board?” they ask, and they cannot accept that it has to be. Frustrated, irritated, angry boards are a direct threat to their CEOs and senior managers.